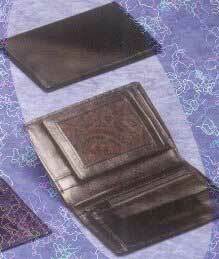 Description : A classic Unisex leather wallet. It is manufactured in Calf and Buffalo hides. A single deep note compartment and twelve slots for credit cards. On opening it, you view a transparent window on the left side and a zip pocket for coins on the right. Two side pockets are available and another small pocket on top of the coin pocket.